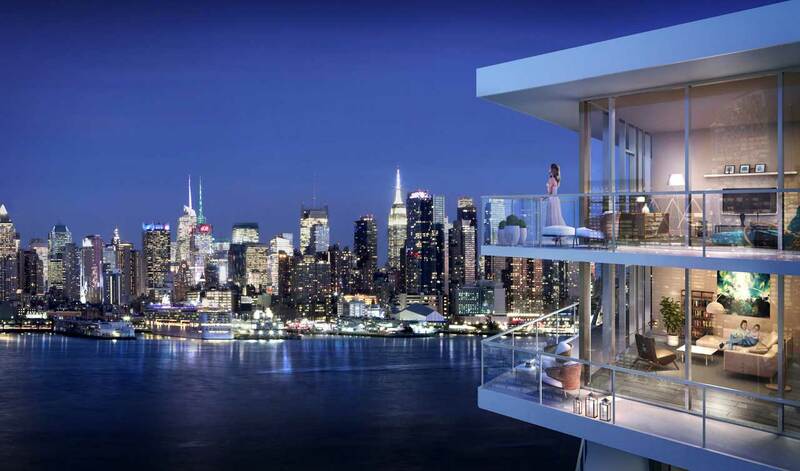 In an established Bergen County location ten minutes from the George Washington Bridge and minutes from the Gold Coast’s bustling Hudson River waterfront, Trio, a modern, amenity-rich condominium, features a collection of Penthouse residences offering luxury living with the comforts of home. Condominiums at Trio include one-, two- and three-bedroom residences, priced from $330,000 and available with immediate occupancy. The Penthouses start from $595,000 and are being offered with incentives up to $50,000. Situated on the top floors of two nine-story buildings in Palisades Park, the limited collection of residences boast expansive living spaces with stylish finishes and appointments. Four distinctive two- and three-bedroom Penthouse floor plans are available, with desired elements such as separate kitchen and dining areas, two-and-a-half to three bathrooms, spacious master bedroom suites with walk-in closets and designer kitchens. Floor-to-ceiling windows bathe the homes in natural light, while hardwood floors, granite countertops, stainless-steel appliances, marble floors and custom cabinetry add style and detail to every corner. Some of the Penthouses offer impressive New York City skyline views, while others feature panoramic vistas of the western-facing landscape. The popularity of the Penthouses at Trio can largely be attributed to a comprehensive presentation which illustrates the luxury, comfort and appeal of living in a premium home in a full-amenity building. A new sales center has debuted in a two-bedroom, two-bathroom Penthouse perched atop the two-mirroring nine-story buildings. The state-of-the-art facility is joined on the highest residential floor by a fully-decorated Penthouse model home, creating a detailed and informative sales and model center at Trio. The Penthouses at Trio provide affordable luxury with prices starting from $595,000. The impressive residences are also being offered with a special limited-time incentive that provides up to $50,000 off the purchase price of two- and three-bedroom homes. In addition to the new Penthouse model a newly decorated two-bedroom model home has debuted at Trio. The residence spotlights the popular 02 condominium line that boasts two full baths, master bedroom suite with walk-in closet, state-of-the-art kitchen with breakfast bar and expansive living and dining areas. In all, Trio’s condominium inventory consists of one-, two- and three-bedroom residences, priced from $330,000 and available with immediate occupancy. 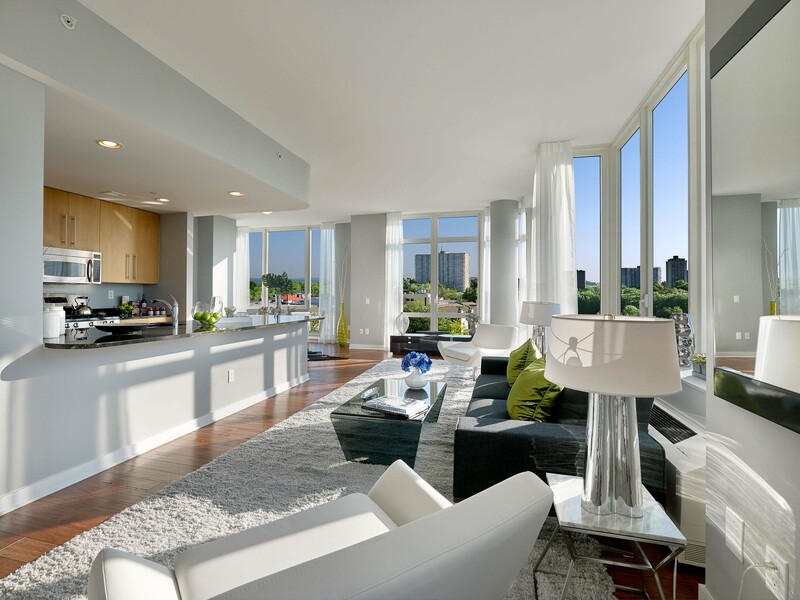 The residences feature floor-to-ceiling windows, hardwood floors, and modern recessed lighting. Gourmet kitchens include granite countertops, stainless-steel GE appliances, custom maple cabinets, and Kohler fixtures. Designer bathrooms feature Crema Marfil marble floors, granite countertops, custom maple vanities, and Kohler fixtures. All homes also come with individual washers and dryers. Homes are available with covered parking. Trio has introduced a creative package that provides up to 97-percent financing for qualified buyers. Combined with an affordable price structure, the program allows buyers to enjoy a high level of luxury in a full service building with a much lower initial financial commitment than a conventional mortgage. Located at 800 12th St. in Palisades Park, Trio boasts a desirable Bergen County location less than ten minutes from the George Washington Bridge and the business, social and cultural offerings of New York City. Trio is ideally situated in an established residential neighborhood minutes from a number of transportation options, including bus service. Shopping enthusiasts will find a myriad of opportunities at nearby malls, such as the Shops at Riverside and Garden State Plaza, as well as a host of brand-name stores, specialty shops and boutiques that line routes 4 and 17. “Of course, the proximity to the George Washington Bridge and the New York Waterway ferry service puts Manhattan’s business, social and cultural offerings a quick trip away,” Hwang added. For additional information on Trio, call 888-479-1842 or visit www.LiveAtTrio.com.